Noah’s Headed To The Big Screen For The Times Square Buddy Walk Kick Off Video 2012! You are here: Home / Family / Noah’s Headed To The Big Screen For The Times Square Buddy Walk Kick Off Video 2012! This weekend The National Down Syndrome Society kicks off Down Syndrome Awareness month with a video presentation in the middle of TImes Square in New York; followed by the 2012 New York Buddy Walk which takes place in Central Park! Above you’ll find the interview our local NBC news affiliate did with us about the Times Square video, and why the Buddy Walk is so important. (By the way did you also know there is a World Down Syndrome Day? Don’t worry, I didn’t either until after Noah was born.) P.S. I apologize in advance for looking so goofy on television….I was looking at someone off-camera on a part I didn’t think was going to air….and of course it did. Awesome. Noah’s (Face) Is Headed To The Times Square Buddy Walk This Weekend! 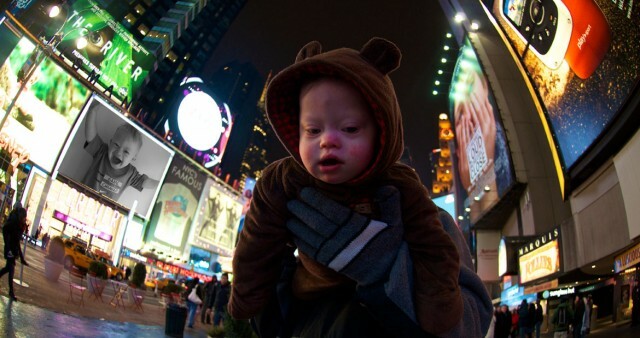 If you know me, you know I’m a huge fan of New York, and especially the bright lights of Times Square (as is Noah!) Which is why I was super excited to find out Noah’s picture was selected to be included in the Down Syndrome Awareness Month kick off video that will be displayed on the big screen in Times Square this weekend. In fact, what’s even more fun is that 2 of Noah’s local friends, Cate and Joseph, are going to be in the video with him! What a fun memory for Noah and his friends! Look hard…do you see Noah??? This is just an “artist” (as in me) rendering..and not the real thing! ha,ha. Since we already made a trip to New York earlier this year, we unfortunately won’t be able to make it this weekend (unless some airline tickets and a hotel room magically appear in our mail box in the new few days.) So you’re going to have to go on our behalf! If you happen to be in New York this Saturday (August 22) be sure to swing by Times Square, watch the video and be a part of the Down Syndrome Awareness Month kick off celebration! We would love for you to go, cheer real loud, take lots of pictures and videos, and come back and share them with us in the comment section below, or on our Facebook page. You knows, you may even run into Noah’s friend Chris Burke (Aka, Corky from Life Goes On) or Becky from Glee while you’re there! We want to personally say thank you to the National Down Syndrome Society for all of the hard work they do to make the New York Buddy Walk such a success…which in turn creates a lot of great awareness in our culture about Down syndrome...and that is a very great thing! You can learn more about the NDSS Annual Buddy Walk by checking out their website and our post from the Dallas Buddy Walk last year! Have you ever been to the New York Buddy Walk? Is it as awesome as I imagine? Feel free to leave a comment and tell us about it. (Bonus points if you leave a video or picture in the comments!) Also are you planning on going to a Buddy Walk this year in your city (wherever that may be.) If so, leave a comment and tell us how pumped (or nervous maybe if this is your first one?) you are about it!